An automated version of Soyuz, known as Progress, was developed to carry propellant and cargo to the Salyut and Mir space stations and it will serve the same purpose for the International Space Station (ISS). Although the Mir and ISS have their own propulsion systems, generally it is the Progress vehicle which will perform periodic reboosting maneuvers to maintain the Space Station orbital altitude. The Progress is approximately the same size as the Soyuz but it has a slightly higher mass at launch of approximately 7150 kg. The Progress spacecraft docks automatically to the space station and there is also a backup remote control docking system. 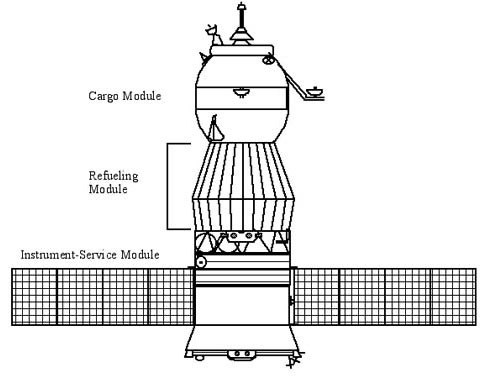 The Progress is composed of three modules: Cargo Module, Refueling Module, and Instrument-Service Module. The Progress M is illustrated in Figure 4. A modified version of the Progress M, called the Progress M1 is planned for operation with the International Space Station. This version will have more propellant tanks for refueling and several other changes. The Progress cargo module is similar in construction to the Soyuz orbital module. The cargo module carries pressurized cargo which the crew transfers into the station through the docking hatch. After the cargo module is unloaded, trash, unwanted equipment, and waste water can be loaded into the Progress for disposal when the spacecraft leaves the Station. In place of the Soyuz descent module, the Progress has a module containing propellant tanks. The Progress is able to transfer propellant into the space station propulsion system through fluid connectors in the docking ring. The propellant in the refueling module can also be used by the thrusters on the Progress vehicle for controlling and re-boosting the Station. The Progress M has four propellant tanks (two each for fuel and oxidizer) and two water tanks. The Progress M1 will have eight propellant tanks and no water tanks. In the Progress M1, water will be delivered in separate containers carried in the cargo module. The Progress instrument-service module is similar to the module on Soyuz but the pressurized instrument section is twice as long and contains additional avionics equipment. The larger instrument section carries avionics which would be contained in the descent module in the case of the Soyuz. A typical Progress mission is similar to a Soyuz mission. The spacecraft is launched by the same launch vehicle inside a similar shroud, however there is no launch escape rocket on the shroud since the spacecraft carries no crew. The Progress spends about two days performing the rendezvous process and docks automatically to the Space Station. Propellant is transferred to the Station tanks through connecting lines in the docking ring The crew unloads cargo from the cargo module and can transfer water manually from the Progress to the Station. When the Progress delivers air or oxygen, it is released directly into the shared atmosphere of the Space Station and Progress vehicle. There are controls in the cargo module for releasing air or oxygen and for transferring water. While the Progress is docked to the Station it uses its propellant and thrusters to perform Station reboost maneuvers. Trash is loaded into the cargo module when the Progress has completed its mission and is ready to leave the Station. Progress vehicles normally remain at the Station for two to three months. After separation, the Progress spacecraft performs a deorbit maneuver and is destroyed as it enters the atmosphere. Sometimes a small ballistic capsule is placed within the top hatch of the cargo module and it is ejected during entry. The capsule is equipped with a heatshield and parachute and is used to return small amounts of payload from the Station. The Progress payload includes cargo in the pressurized cargo module and propellant in the refueling module. There will usually be some excess propellant in the propulsion system tanks in the ISM which can also be used by the Station. Table 2 provides a summary of the approximate payload capacity of the Progress vehicle. The relative amounts of pressurized cargo, refueling propellant, air, and water will vary within the constraints of the total payload limit. For example, if the maximum amount of propellant is carried then the amount of pressurized cargo will be less than the maximum amount. The payload masses for Progress M1 will increase within the ranges shown as improvements are made to the Soyuz launch vehicle. The lowest value corresponds to the capability with the current Soyuz launcher.